The contents of a secret report by Israel’s Mossad spy agency on Iran’s nuclear programme leaked to the media this week are shocking and predictable in equal measure. 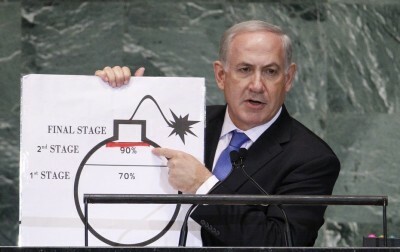 Shocking because the report reveals that the Israeli prime minister, Binyamin Netanyahu, has spent years trying to convince the international community and Israelis that Tehran is racing towards building a nuclear bomb, when evidence presented by his own spies suggests the opposite. Predictable because since early 2011 Israel’s security establishment has been screaming as loudly as any secret service realistically could that Netanyahu was not to be trusted on the Iran issue. The significance of the leak is not just historical, given that Netanyahu is still trying to scaremonger about an Iranian threat and undermine negotiations between western powers and Tehran. According to the report, leaked to al-Jazeera and the Guardian newspaper, Mossad concluded in 2012 that Tehran was “not performing the activity necessary to produce weapons”. At the time, Netanyahu was widely reported to be pushing for a military strike against Iran. He had recently flourished a cartoon bomb at the UN in New York, claiming Tehran was only a year away from developing a nuclear weapon. The international community had to act immediately, he said. Mossad however estimated that Iran had limited amounts of uranium enriched to 20 per cent, far off the 93 per cent needed for a bomb. Tehran has always argued it wants low-grade uranium for a civilian energy programme, as allowed by the Non-Proliferation Treaty that Tehran it has signed. In 2012, the New York Times reported that the Mossad and the US shared similar assessments of Iran’s nuclear programme. “There is not a lot of dispute between the US and Israeli intelligence communities on the facts,” a senior US official told the paper. Earlier, in 2007, a US spy agency report suggested Iran had abandoned any efforts to develop a military nuclear programme years before, and was not trying to revive it. This week’s leak has been downplayed by the Israeli media, at a time when it has the potential to seriously damage Netanyahu’s election campaign. His rivals are making almost no capital from the revelations either. The low-key reception is even more surprising, given that Netanyahu is expected to reprise his 2012 fearmongering at the UN in an address to the US Congress next week. He hopes to undermine talks between the US and Iran on reaching a deal on the latter’s nuclear programme. Netanyahu’s move – made without coordination with the White House – has infuriated Obama and brought relations to their lowest ebb in living memory. This week it emerged that Netanyahu also failed to consult his national security adviser, Yossi Cohen, who oversees Israel’s strategic relationships. Cohen, who took up the post in 2013, served in Mossad for 30 years. In justifying the lack of furore, Israeli security analysts claim that Mossad estimates from 2012 do not diverge significantly from Netanyahu’s public position. Both were agreed that Iran is seeking to build a bomb, they argue, but the two sides took a different view on the rate at which Iran was enriching uranium and thereby moving towards the moment it could make a weapon. That argument is far from convincing. So what sources is Netanyahu relying on if not his own international spy agency? As Mossad’s estimates coincided largely with Washington’s, it appears he was not even receiving conflicting briefings from the Americans. Also, unlike Netanyahu’s claim at the UN, the Mossad document did not suggest Tehran was trying to build a bomb. It stated that Iran’s efforts to develop what Tehran claims is a civilian nuclear programme would give it a technological capacity that could be redirected at short notice towards a military programme. But that is true by definition. Advances in any state’s development of nuclear technology – even if only for peaceful purposes – help move it closer to a situation where it could choose to make a bomb. The matter in contention has always been whether Iran intends to make such a switch. Netanyahu has insisted that indeed that is Iran’s goal; the Mossad report suggests there is no evidence for such an assumption. The speed of enrichment then becomes the nearest thing to an objective yardstick for interpreting Iran’s behaviour. And Mossad viewed Iran’s enrichment rate as no cause for concern. More significantly, however, the document provides the context for understanding a vicious feud that has been brewing between Netanyahu and his spy chiefs for at least the past four years. Unable to speak out directly themselves, serving spies have instead been using as mouthpieces the departing heads of Israel’s leading security agencies. The most significant has been Meir Dagan, who has been battling Netanyahu in public since he stepped down as Mossad chief in December 2010, more than a year and a half before the leaked report was published. In January 2011, a month after leaving Mossad, Dagan called Netanyahu’s hints that he wanted to attack Iran the “stupidest thing I’ve ever heard”. Ephraim Halevy, a predecessor of Dagan’s, also cautioned that Iran did not pose an existential threat as Netanyahu claimed, and that an attack could wreck the “entire region for 100 years”. Yuval Diskin, who quit the Shin Bet domestic intelligence service in 2011, also joined the fray. A few months before the prime minister’s UN speech, he accused Netanyahu and his defence minister Ehud Barak, who was also said to support an attack, of being “messianic”. Netanyahu’s judgment in critical situations was also called into question by an article in the Haaretz newspaper in summer 2012, shortly before his address at the UN. In February 1998, wrote Haaretz, Netanyahu had ordered for the first time in Israel’s history the use of its nuclear weapons – against Saddam Hussein’s Iraq after it launched missiles at Israel in retaliation for the West’s punitive sanctions and no-fly zone. The order was rescinded, according to Haaretz, only after three generals talked him out of it. The incident was apparently well known to Israeli military correspondents at the time and one, Zeev Shiff, wrote an article urging what he called a “Red Button Law” that would prevent a prime minister from ever having such unilateral power again. Nonetheless, given the black arts of all intelligence services, it was possible that the image of an emotional and unstable Netanyahu may not have been entirely reliable. Dagan and the rest of the Israeli security elite were not opposed to an attack on Iran. They simply objected to the idea of a go-it-alone strike by Israel of the kind Netanyahu was threatening, fearing it would fail to destroy Iran’s nuclear programme and only serve to stiffen Tehran’s resolve to seek a bomb. They preferred that the US lead any attack. One suspicion was that Dagan and the others had not really broken ranks with Netanyahu but were trying to help him to mislead Iran and the Americans in a sophisticated game of good cop, bad cop. On this view, Dagan’s criticisms were designed to suggest to Washington that Netanyahu was a loose canon who might push Israel into a lone-wolf attack on Iran with disastrous consequences. Were the Americans to grow excessively concerned about Netanyahu’s intentions, it might encourage them to take on the task themselves or to impose savage sanctions on Iran to placate the Israeli prime minister. The latter policy was, in fact, later adopted. While it is still possible that this was Israel’s game plan, the newly leaked document appears to confirm that there was and is real substance to the feud between Netanyahu and the security establishment. In another leak, this one a confidential US embassy cable released by Wikileaks in 2010, Dagan told US officials that covert action, including helping minority groups topple the regime and actions to degrade Iran’s nuclear technology, would suffice to contain Iran’s programme for the foreseeable future. The very public and unprecedented nature of the falling out on an issue considered by Israelis to be an existential one most likely damaged Israel national interests. It undermined the Israeli public’s confidence in their leaders, gave succour to Tehran that the Israeli defence establishment was in disarray, and helped set Washington on a collision course with Israel over Iran. Netanyahu’s current clash with Obama over Iran appears similarly to be doing yet more harm to the two countries’ special relationship.